Essential Albums – Your friends and neighbors around Janesville present their favorite albums from any genre, and tell you all about what makes them so awesome! 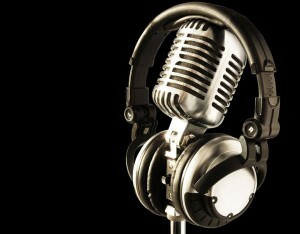 Catch new episodes 8pm Thursdays on 103.5 FM WADR, and stay tuned at 9pm for In The Stratosphere! Freak Radio – Saint Christopher compiles an eclectic 3 hour broadcast of local talent, rockabilly, punk, power pop, ska, reggae, and alternative, plus local music news and interviews with up and coming artists. Catch the Saint 10PM Thursdays following In The Stratosphere on 103.5 FM WADR! Holmes World – A Sherlock Holmes Program brought to you by Gayle Lange Puhl, noted Sherlockian, along with her companion, Sherducky. Gayle presents interviews, book reviews and other Sherlock Holmes related material. Get answers to questions about Sherlock Holmes or Arthur Conan Doyle on the Holmes World Facebook page, as well as previous shows you can download and listen to. In The Stratosphere – Check out Rock County’s local music scene every week, with news, interviews, and special in-studio performances! International Pop Overthrow – What do you think of when you hear “pop music?” Madonna? The Killers? Elvis Presley? Or do you think of it as a style of music? Is Indie music pop? Can underground bands who play upbeat music be considered pop? What about melancholy music with popular following? Special K takes you on a journey to find those rare gems and familiar favorites, every decade, every genre. TJ and The Stacks of Wax – Join TJ each and every week, as he takes you back in time inside his TJ Time Machine to an era of cheesy humor & fun filled memories, filled with sock hops, soda fountains and the greatest ROCK & ROLL favorites from the 50s, 60s & 70s. So turn off your WiFi & crank up your HiFi and have some fun with a Blast From Your Past, right here on 103.5 FM WADR! New shows air 6pm Sundays! And there’s even more great shows to come! THIS is Wisconsin’s Alternative Destination Radio, 103.5FM WADR! 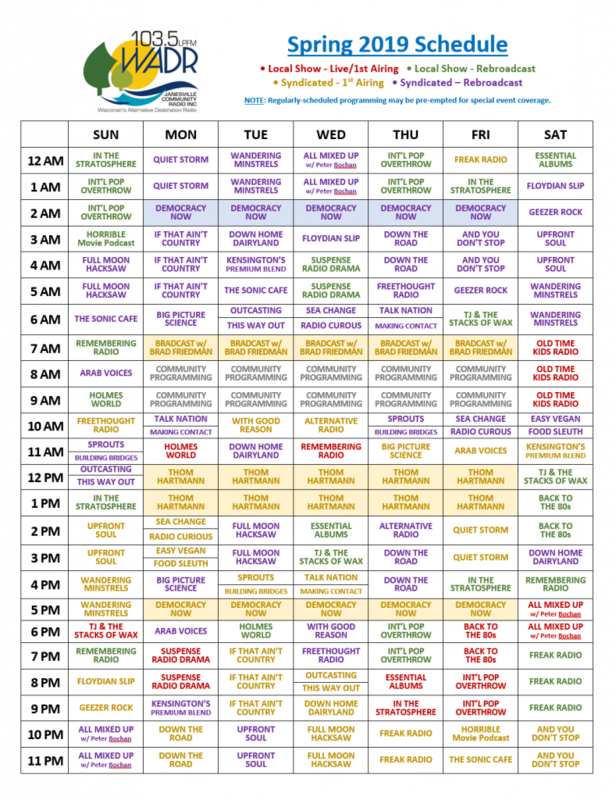 Here is the latest broadcast schedule, available as a PDF. 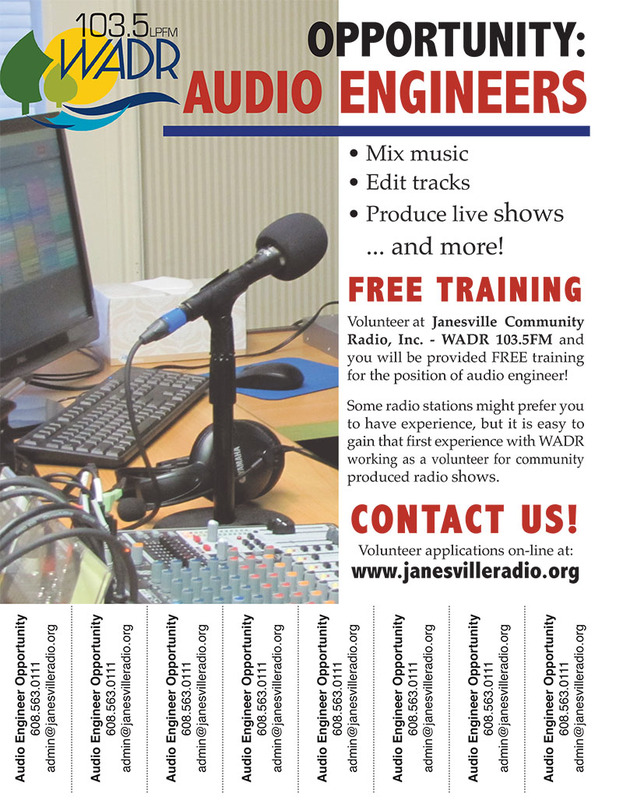 Gain valuable experience in radio production, and have fun volunteering for Janesville Community Radio, 103.5 FM WADR! No experience necessary! Fill out our Volunteer Application to learn more.